Published: April 19, 2018 at 02:19 p.m. Which NFL stars have looked the most out of place in a uniform that didn't connect them to their glory days? Dan Hanzus takes us on a walk down memory lane to gawk at All-Pros in duds that were easy to forget. A warning: Some of these photos will be jarring ... maybe even painful to look at. Consider yourself warned. There may be more famous Cowboys players, but few have looked more natural with a star on their helmet than Dez Bryant. The playmaking wide receiver is now on the open market after he was cut loose by the team that drafted in the first round of the 2011 NFL Draft. 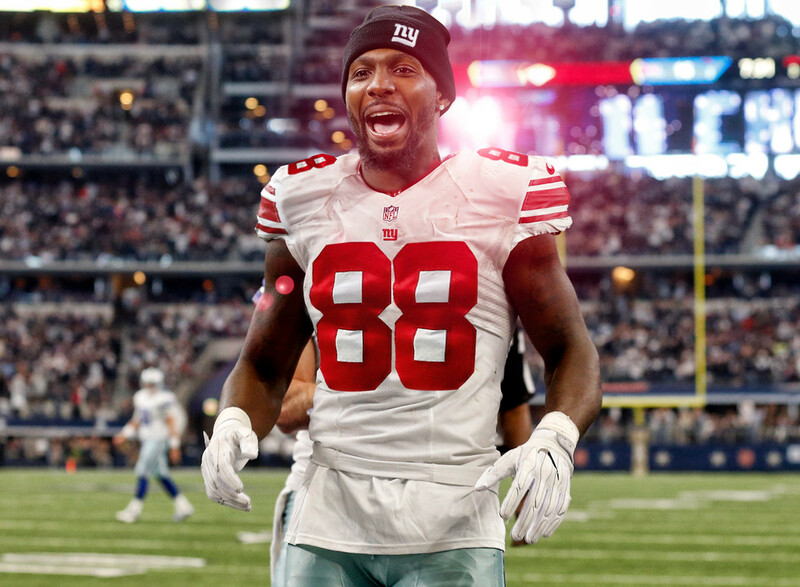 Bryant has professed his preference to stay in the NFC East and get some revenge on "Garrett's guys", but -- as you see above -- it would take some time to get used to Dez in Giants blue, or really any other uniform. It's still hard to believe Brett Favre played for the Jets. He was pretty damn good too, at least until he suffered a biceps injury sapped his arm strength and sent Gang Green into a spiral after an 8-3 start. (Double agony for Jets fans: This was the year Tom Brady ripped up his knee and exited the picture after Week 1.) Favre fake retired and landed with the Vikings, his preferred destination for maximum Packers revenge duty. Favre and the Packers eventually buried the hatchet, which is nice. This is how you know you're a civic icon: When a city commissions a life-sized bronze statue of your likeness and sticks it right in the center of the local airport. That's what Pittsburgh did with Franco Harris, who was the backbone of the Steelers offense during their 1970s dynasty that produced four Super Bowl titles and one Immaculate Reception. Harris and the Steelers ended things with a sour contract stalemate, which paved the way for one utterly forgettable season with the Seahawks. Joe Cool was the face of the NFL during the 1980s, which made San Francisco and the 49ers the center of the football universe. Injuries and the unavoidable presence of Steve Young prompted Montana's Niners exit, which led to a solid two-year starter for the Chiefs. Montana provided some vintage moments with his second team and even guided K.C. to the AFC Championship Game in 1993. Still, Montana in 49ers red and gold is one of the iconic looks for any football player, ever. Even Chiefs fans will admit to this. Joe Namath is the Jets -- it doesn't make sense that he'd play anywhere else. His nickname is literal allusion to a major entertainment district in Manhattan. He's Broadway Joe! Still, Namath thought he had enough in the tank to give it a go with the Rams in 1977. He was benched after a four-interception loss in Week 4 and retired at the end of the season. On the plus side, it was probably still pretty good to be Joe Namath in Hollywood back then. Peterson is perhaps the greatest running back of his generation and he'll always be remembered for his dominant years with the Vikings. It never felt right when he landed with the Saints, the team Minnesota fell painfully short against in the brutal 2009 NFC Championship Game. A mid-season trade to the Cardinals last season was equally awkward from a visual perspective. All Day should have stayed all purple. Rice is inarguably the greatest wide receiver in NFL history. He owns every relevant statistical record and remained a Pro Bowl-level producer over parts of three decades. He is best known, of course, for his dominant 15-year run with the 49ers, where he caught roughly three million touchdown passes from Joe Montana and Steve Young. He was still balling when he moved to the Raiders, where he put together a 1,200 yard, seven-touchdown season at age 40. There was considerable less glory in Seattle, where Rice played his final games in 2004. One positive: He did somehow convince Steve Largent and the Seahawks to unretire No. 80 for a few months. Call it GOAT power. If Ray Lewis was the heart of the Ravens' best defenses of the past 20 years, then Ed Reed was the soul. In an ideal world, Reed -- like Lewis -- we never play a snap for another team. But Reed wanted to keep playing, and the Ravens weren't willing to take out the checkbook. Reed signed with the Texans, but clearly wasn't the same player after undergoing offseason hip surgery. When he told the press that the Texans were "outplayed and outcoached" following a loss to the Cardinals, he was released. Reed quickly caught on with the Jets and coach Rex Ryan, who worked with Reed during his Ravens hey-day. Unfortunately, the old magic was gone. Simpson rushed for more than 10,000 yards in nine seasons with the Bills, including a 2,000-yard campaign accomplished during an era when there were only 14 games in the regular season. (!) He was eventually traded to the 49ers, his hometown team, where he managed to rush for 1,000 yards over two seasons before hanging up the cleats. Things got, well, pretty dark from there. He may not have had the style or grace of Barry Sanders, but no running back in the '90s was more successful and productive than Emmitt Smith. In fact, no running back has ever been more productive -- period. Smith remains the league's all-time rushing leader. Smith was a legendary Cowboys star, but he didn't have the same magic in Arizona, where he averaged 3.2 yards per carry over two seasons before calling it quits after the 2004 campaign. One of the most important players in NFL history, Johnny U will always be synonymous with his legendary run with Baltimore Colts that included three MVP awards and three NFL championships. In 1973, Unitas made four forgettable starts in his lone season with the Chargers and retired the following summer. At least he got a tan out of it.